Currently available in the U.S.
SoloUva and Arcari e Danesi are grape growers and winemakers in Franciacorta (Brescia province, region of Lombardy in Northern Italy). They both produce Franciacorta DOCG using Chardonnay, Pinot Nero, and Pinot Bianco grapes. 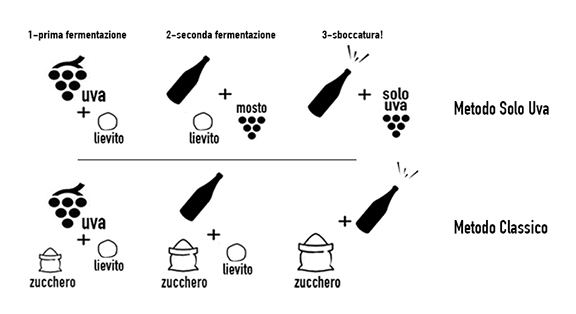 Franciacorta is a sparkling wine made using the metodo classico or classic method. The wines are double-fermented in bottle, aged on their lees, and then disgorged and aged in bottle before being released for sale. In the case of SoloUva, no cane sugar is utilized at any point during production. The second fermentation is provoked using grape must that has been frozen and reserved at the time of harvest. In the case of Arcari e Danesi, the winery is in the process of converting to 100% production using the SoloUva (“just grapes”) method, although some current release wines have been vinified using cane sugar. See below for the wines currently available. The following wines are currently available in the U.S. This entry was posted in SoloUva by Giovanni Arcari. Bookmark the permalink.